AN INQUEST INTO the deaths of 10 victims of a fire at a Dublin halting site has heard the probable cause of the fire was a chip pan that had been left on an electric cooker. 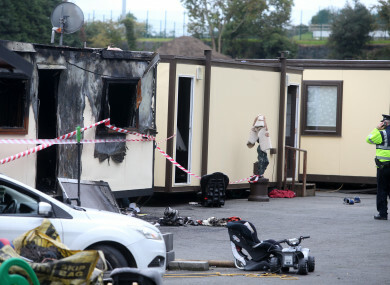 Five adults, five children and an unborn baby died following the fire at the Glenamuck Halting site in Carrickmines, Dublin 24 in the early hours of 10 October 2015. The victims were Thomas Connors (28) his wife Sylvia (30) and their children Jim (5), Christy (3), and five-month-old Mary. Jimmy Lynch (39), Sylvia and Willie’s brother, also died in the blaze. At the Dublin Coroner’s Court this morning, Garda Detective Inspector Martin Creighton told the jury that the probable cause of the fire was determined to be an electric cooker in the kitchen of the Connors home which had a chip pan on it. He said the pan was on a hot plate which was on full power. The victims were sleeping in the same unit when the fire broke out and it spread to a second housing unit which was closeby. The jury was shown a number of detailed maps, CCTV footage, drone footage of the aftermath of the fire. They were also shown a diagram of where each of the victims’ bodies were located at the time of their deaths. The jury also heard from a number of Dun Laoghaire-Rathdown council executives and staff, including Tom McHugh, director of housing and community. He said the site had been set up as emergency temporary accommodation for the Connors family in 2008. The council had originally intended to move the Connors from a site in Sandyford to one in Rathmichael but witnesses at the inquest said there was opposition from a family that was living at the site. The council decided to establish this temporary site as an immediate response. McHugh said the intention was never for this site to become a permanent solution as there were plans to widen the road at this location. He also told Coroner Dr Myra Cullinane that the normal planning and safety regulations and guidelines for Traveller accommodation did not apply to the site because it was a temporary emergency site. In 2015, the family had grown and the council had already extended the site to accommodate them over the years, when Thomas and Sylvia Connors moved another portacabin to a field adjacent to the site. Although the family had not been given permission to move into this field, the council staff said a decision was made to put tarmac down at the area and provide services like water, electricity and sewage to Thomas and Sylvia. Conor Peoples, who was a senior staff officer in the council’s housing department at the time of this work, said he had marked out where the unit was to be placed on top of the tarmac. He was later informed that it had not been possible to place it there because of a slope in the ground. Instead, it had been placed parallel to the road, and just one metre away from another unit on the site. The inquest heard that the optimum distance is six metres. Other witnesses told the inquest that on the day the unit was moved in, Thomas Connors was keen for it to be placed in its final location so he would be able to see his children walking to and from the outdoor toilets when it was dark outside. Peoples told the coroner that there was “no training or instruction on the guidelines” and no reference to them in meetings about work on the site. “We didn’t think there were any safety issues,” he said. The jury also heard from Karl Drury, a council caretaker. He said there were four or fire extinguishers in place around the site that were checked every six months and that fire blankets and smoke alarms had been installed inside the units. Drury has worked in the Traveller accommodation unit of the council for 17 years and said he visited the site regularly and had a good relationship with the Connors. The inquests, which are being dealt with as what is known as a ‘joinder of inquests’ because the deaths are a result of the same incident, are scheduled to continue for up to two weeks. At the beginning of this morning’s hearing, Dr Cullinane told the jury that the inquest was “nothing to do with criminal or civil liability” and that there “can be no finding of fault or exoneration of anybody”. “There are no sides and this is not a trial,” she said. Tomorrow the coroner will hear from members of the Connors and Lynch families, and from the taxi driver who first came across the blaze at the site. Previously, the coroner’s court heard that no criminal charges will be brought in relation to the deaths of ten fire victims. The Director of Public Prosecutions made this decision following the submission of a case file on the tragic blaze by An Garda Síochana. Evidence from pathology staff who conducted post-mortem examinations will also be heard. - With reporting by Louise Roseingrave. Email “Inquest hears source of Carrickmines halting site fire was chip pan in kitchen”. Feedback on “Inquest hears source of Carrickmines halting site fire was chip pan in kitchen”.